Located in sunny California, football has been played at the site of Stanford Stadium for over nine decades. However, the stadium many fans attended games at for over 80 years no longer exists as a new Stanford Stadium was constructed in 2006. 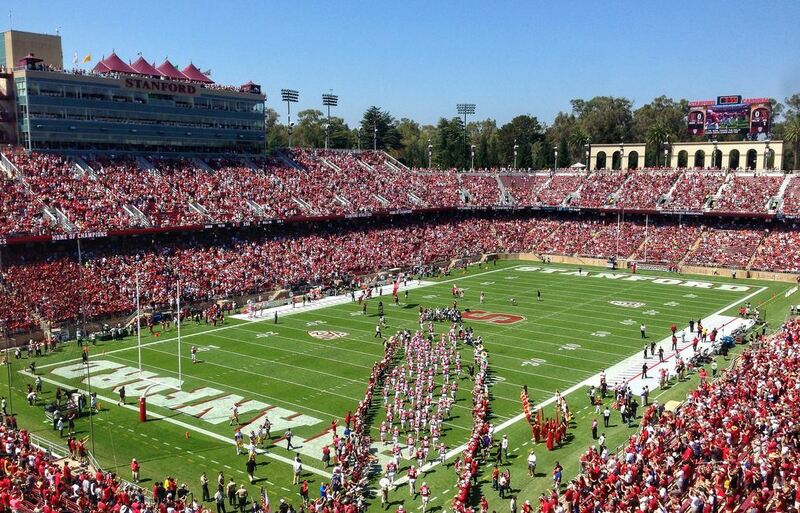 The original Stanford Stadium was built when the Cardinal’s rival, the University of California, built a new stadium. This was a fierce rival that led the two schools to see who could construct a new stadium first. With enough support from alumni and others, Stanford was able to raise enough money to construct Stanford Stadium in 1921. The stadium was built and completed when the Cardinals played the Golden Bears on November 19, 1921. Built at a cost of just over $500,000 Stanford Stadium had a seating capacity of 60,000. The one tier grandstand was in the shape of a horseshoe in 1921. By 1925, just over 10,000 seats were added to Stanford Stadium, partially enclosing the horseshoe. Additionally, 14 rows of seats were built around the rim of the stadium in 1927. A new press box was added at Stanford Stadium in 1960 and tunnel entrances were constructed on the west side. The last major addition to Stanford Stadium was in 1978 when scoreboards were added above the stands in the north and south end zones. The stadium had a capacity of 85,500 when it closed. The stadium hosted both the Super Bowl and the World Cup. In August 2005 the Cardinals announced plans to demolish Stanford Stadium immediately after the 2005 season. Built on the same location, the new Stanford Stadium opened in time for the 2006 Cardinals season. This new modern stadium seats less fans than the old Stanford Stadium, but brings fans closer to the action on the field. The $90 million, 50,000 seat stadium has 437 club seats and opened on September 16, 2006. Before the start of the 2013 season, twin HD video/scoreboards replaced the original ones at Stanford Stadium.